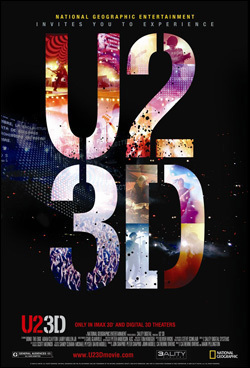 U2 in 3D - what a concept! The cliche that iMax is larger than life rings true with this live U2 performance filmed at South American concert dates. Initially begun as an experimental project, the members of U2 felt confident that using this new advanced technology to present U2 would generate an incredible impact with its worldwide legion of fans. U2 3D is the band's second concert movie since 1988's Rattle and Hum. Although too much time passed between celluloid premieres, this astounding iMax visual is almost worth the wait. By the way, are the Rolling Stones paying attention? Sir Mick and the lads had better sign on to producing their own ultimate live statement as U2 has. Bono, The Edge, bassist Larry McMullen and drummer Adam Clayton almost walk off the iMax screen into the face of cinema spectators during the spectacular staging. Captured live in 2006 during their protracted Vertigo World Tour, U2 are swarmed by an unrelenting sea of outstretched arms that would surely envelope them. The setlist employed by U2 is a curious collection of material. Four songs from 2004's How To Dismantle An Atomic Bomb, two from 1992's Achtung Baby, three from 1987's The Joshua Tree, two from 1983's War, plus three additional tunes make up the 14 song soundtrack. Considering U2's extensive prolific catalogue, the selected song choices performed by the group in the film were acceptably adequate. South American audiences were chosen as having the same passionate fervor as Irish U2 fans. A total of seven out of eight Latin American performances were filmed in this groundbreaking new 3D technology. 140 personnel were necessary to operate the 3D camera equipment. The group members acted on their primary concern in minimizing interference from the 3D camera crews with the audience enjoyment of their concerts.